Learn how to break up your team and proposals into various departments for better reporting and more flexibility. Departments lets you create separate groups of team-members within your Proposable account. This lets you segment team-members, analytics data, and library templates in ways that make sense for your company. Whether you have a multiple sales teams selling different products, or have multiple teams selling under different brands, you now have the ability to create, segment and track each of these unique departments within Proposable. One key component of Proposable is the Library that allows you to store all of your content such as Templates, Sections and Line-Items. Adding value to the Library is the ability to share your content by department. This works well for organizations who sell in various languages or countries. You can now share your content with a department. This is a great way to avoid sharing irrelevant content with team members. Similar to Dropbox and Google Drive, you can either share a single document (or template), section or line-item to a specific department. However, you can also share an entire folder this way you can move content into the already shared folder. Proposal management and tracking is key when having a large distributed team. This functionality allows you to drill-down In Progress proposals by department and or salesperson. This is a great way to hold salespeople and departments accountable for their In Progress, Accepted and Declined proposals. In some cases you may have a department that deals in other countries which requires you to support multiple currencies. With the departments feature you can specify a currency for a particular group or country. You can also have multiple users in multiple departments this way if you have a sales team member selling in North America, they can send a proposal in either USD or CAN dollars. Sometimes, our customers need to customize the "Branding" of a department, for when a department was created for a different business unit that has it's own unique brand or if you have multiple brands underneath you account. 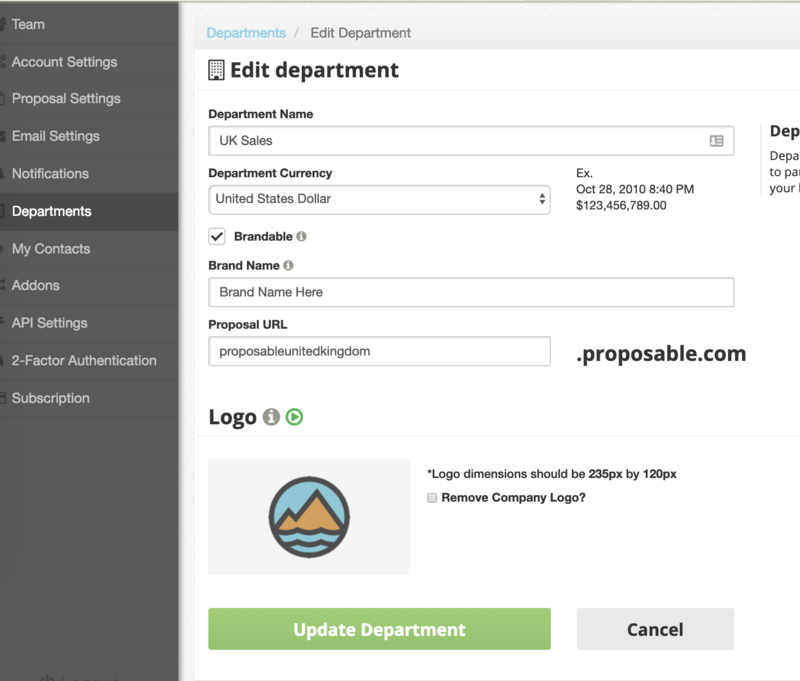 You can customize the "display name", "proposal URL", and "proposal logo" which will all display when proposals are sent from this department. Want to learn more about our Departments feature? Request a demo and we’ll give you the run-down of how this can help your organization keep a pulse on sales teams, proposals and your content.